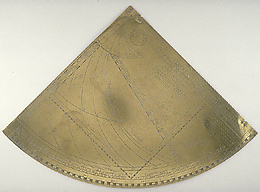 This finely engraved and unusually large quadrant appears to have been made for Edward VI (reigned 1547-53) in 1551. In addition to the King's name, the instrument carries three sets of initials: 'T. G.', 'J C' and 'W B'. 'T. G.' on the reverse may refer to the instrument maker Thomas Gemini. 'J C' on the front at the curved edge could be John Cheke who fostered the study of mathematics at university and at court and in 1551 became tutor to Prince Edward. His heraldic device appears on an astrolabe made by Thomas Gemini in 1553. Finally, 'W B' on the front, close to the table of the initial years of lunar cycles, may be William Buckley, who made a ring dial for princess Elizabeth. The instrument has markings for an equal and an unequal hour quadrant and tables for the determination of Easter on the front and markings for a sinical quadrant on the back.